Bohemian treasure’s collection of handmade bohemian style dream catchers will make a perfect home decor or gift when you want to share peace of mind and well-being with loved ones. 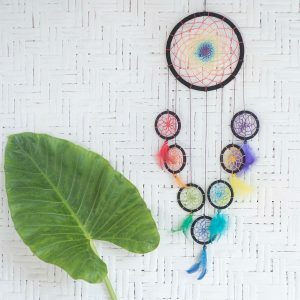 The dream catchers work as an amazing and unique wall decoration as well as working as a way to keep those nightmares away! Good quality of sleep is crucial for a balanced physical and mental health. Waking up energized and motivated will make you be able to use your strengths as an impulsion and your weaknesses as an inspiration to develop. 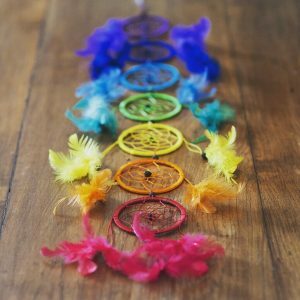 This is our bohemian style dream catchers help you with. Set your mind free from all the overwhelming thoughts and let it soar. Did you know that dreamcatchers were first made by the ancient American Ojibwe nations? According to their legends a mystical Spider Woman was the spiritual protector of the tribe who took special care to children and babies. When the Ojibwe community grew, Spider Woman could no longer look after everyone and made the first dreamcatcher what mothers recreated as a talisman to protect sleeping people. They believed that when the morning sunshine reaches the net, all the dreams the night air is filled with are caught up – good ones pass through but bad ones get stuck. Its circle shape represents life and provides the continuous flow of forces. Feathers serve as a fluffy ladder to help good dreams descend upon gently and beads or crystals are responsible for holding nightmares and bad thoughts back although some legends say they symbolize the spider of the web. 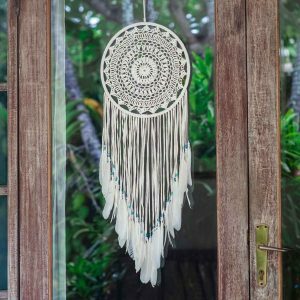 Have yourself and your most loved ones a handmade bohemian style dream catcher for the boho home as a positive gift for protection and to decorate the walls.